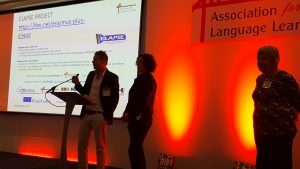 Language World (the ALL's annual conference) is one of my favourite event of the whole year: professionally and personally! Below are some notes on what I experienced and learnt this year. I actually spent 2 days walking round people armed with my Zoom H5 microphone and claiming to be the unofficial audio reporter for LW2019: click here to listen to the resulting sound bites of the conference. Thanks to all who so kindly contributed! Richard Tallaron from LFEE told us about the amazing Erasmus+ ELAPSE project: there are free resources available on their website for teachers who want "to give CLIL a go". NB CLIL stands for Content and Language Integrated Learning and refers to teaching subjects such as science, history and geography to students through a foreign language. 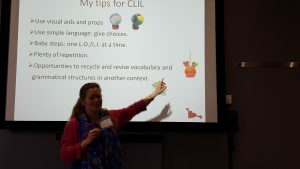 Nadine Chadier shared the thrill of CLIL and definitely made me want to have a go! She admitted it requires a lot of preparation but advises us to offer choices in the language all the time, use cognates (our friends), use props, make visual, make it very repetitive and play on emotions. Please tell me in the comments if you have use CLIL before and how! Vicky Cooke got us thinking about what being a linguist means to us. She suggested the following needed to be present: memorisation, emerging independence, curiosity, etymology, confidence, enjoyment and grammar geekery. She shared with us how she cultivates those. I agree with all of them, especially the etymology one: I have ordered myself a copy of the "Oxford School Dictionary of Word Origins" to refer to in class so the children and I can make even more links between English words and words in French and Spanish. It helps support literacy so much. What makes a linguist in your opinion? 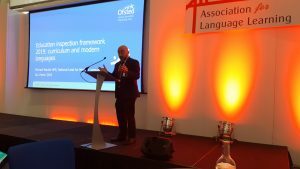 Michael Wardle HMI, National Lead for Modern Languages, updated us on the new OFSTED framework and its implications: the focus is on a broad and balanced curriculum; the curriculum is at the heart of the work; the curriculum needs to be ambitious and inclusive. 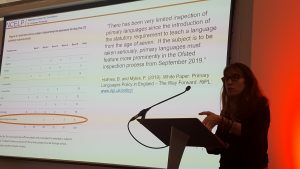 This is good news for languages, especially in primary schools, but it comes with additional responsibilities and levels of accountability which we have to bear in mind. I personally hope support and resources will be offered to schools so they can be truly ambitious with their curriculum. Lisa Stevens talked about stories; it is always interesting for me to look at how we can use them from a different perspective. She encouraged the use of familiar stories; suggested it was "the way we tell them" (I am sure you will agree! ); advised the use of dual/bilingual texts; stressed the importance of active listening; suggested using play scripts; highlighted the importance of encouraging participation. She encouraged us to participate too: I even got to be Sleeping Beauty, as you can see! 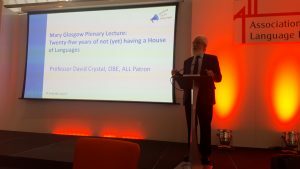 David Crystal (of whom I am a massive fan) talked us through 25 years of not (yet) having a House of Languages". He did however recommend The National Museum of Languages in Washington, Mondo Lingua in Paris and (much closer to my home and heart) the Littiwake Trust's Multilingual Library in eldon Garden, in Newcastle upon Tyne. Road trip anyone?! Sara Montero and Noelia Rivas showed us some practical examples of CLIL and really inspired me (and others am sure) to give this a go. They recommend adding one CLIL unit to the curriculum every year and linking it to other current subjects in school. It requires more preparation but is more challenging cognitively and develops higher thinking skills. Rachel Hawkes blew us away with her presentation about curriculum design. 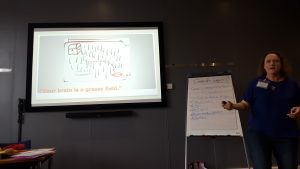 She looked at intent as meaning the curriculum itslef, implementation meaning the teaching and impact meaning the outcome, and she developed those ideas. Click here for some of the resources which she recommended, particlularly for a more systematic teaching of phonics. 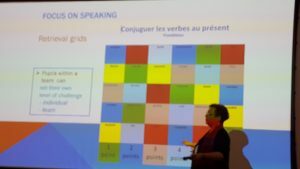 Danièle Bourdais reminded us about geat games for the languages classroom and gave us lots of ideas for new ones. If you do not yet own her book "Games for teaching primary French", I strongly recommend it to you: the activities are transferable to other languages and great for older children too! 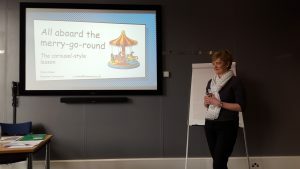 Claire Owen's focus was on research-based motivating strategies, one of those being the use of carousels in lessons. They hit the criteria of competence, relatedness and autonomy, which lead to high motivation, but need thorough planning and preparation. You must only use them every few months for full impact. This has inspired me to organise a carousel lesson again soon, as I have not done so for ages now. 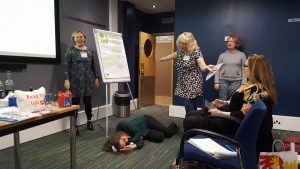 All in all, it was a fantastically inspiring conference, as always. I am already looking forward to next year's theme: ALL WORKING TOGETHER! Most of the presentations from the conference are available by clicking here. If you were there, what was the highlight of Language World for you? Please tell me in the comments below!